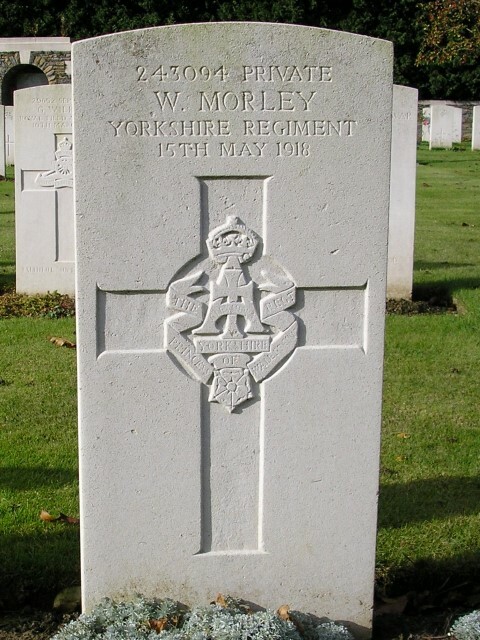 243094 Private Walter Morley, 4th Battalion, The Yorkshire Regiment was killed in action 15 May 1918 and is buried at the ANZAC Cemetery, Sailly-sur-la-Lys, France. He was 35 years old and is commemorated on Evenwood War Memorial. There are also 2 other children recorded, Florrie bc.1897 and Ernest bc.1900 both at Lands but Ann would have been in her late 50’s when they were born which seems unrealistic. Where they visiting relatives? In 1901 the Morley family were residents of Lands Bank where 64 year old Thomas was a retired coal miner, 32 year old William, 30 year old David, 25 year old David were coal miners (hewers), 13 year old Herbert was working in a coal mine and 21 year old Thomas and 19 year old Walter were quarrymen. The family originated from Cambridgeshire with the eldest 2 children, William and David being born in that county. They appear to have moved up to Durham between 1871 and 1876. George, the third child was born at Lands c.1876. In 1911, Robert Conlon lodged with William and Phoebe Morley. 31058 Private Robert William Conlon, 2nd Battalion, York and Lancaster Regiment died of wounds 13 September 1916 and he is buried at Peronne Road Cemetery, Maricourt. Walter Morley enlisted at Bishop Auckland into the Yorkshire Regiment being given the regimental number 243094. The service record of Private Walter Morley has not been researched so the date he enlisted is unknown. Since he was not awarded the 1914-15 Star then he did not enter France until after 31 December 1915. In all 22 officers and 349 non-commissioned officers and men were killed, wounded and missing. 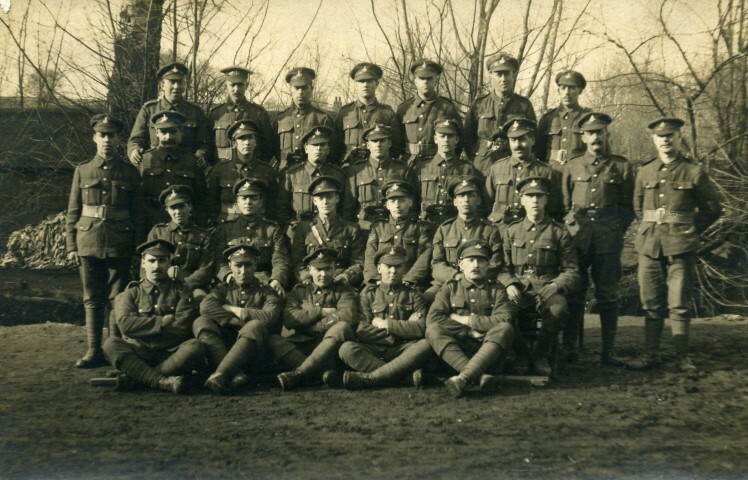 2 April 1918: the battalion moved to Bethune, remaining until the retreat ended being heavily involved in re-organisation after the heavy losses in all ranks since 23 March. During April no fewer than 22 officers and 802 Other Ranks joined the 4th Battalion, many of whom had recovered from previous wounds. 8 April: orders were received to leave Bethune to move to Lavente since the 50th Division was required for the Battle of Lys, just commencing. 9 April: The 50th Division was to replace Portuguese troops. At midday, the battalion was ordered to hold the line at Sailly-sur-Lys and at 2 pm. The work of digging in started. The 4th East Yorkshires were on the right and the 21st Middlesex was on the left. By 4 pm. All Allied troops were withdrawn to the western bank of the Lys. An unsuccessful attempt was made to blow up the Sailly bridge however the bridge was held and the Germans were denied passage over it but they passed the Lys to the north and formed a line to right angles to the 4th Battalion. 10 April: at about 11 am, the troops occupying the line at right angles to the 4th battalion were driven back so that the left flank was exposed and at the same time, the battalion was being strongly attacked from the front, they were compelled to fall back. The new line was held all night. 11 April: morning, the Germans attacked in great force and a further withdrawal was forced upon the Green Howards. Units became considerably disorganised. At the cross roads to the west of Doulieu, battalions of the 150th Brigade were ordered to assemble then Vierhouck was named as the place of assembly. Troops were falling back and many rejoined the Brigade at Arrewage. 12 April: Many casualties were incurred as units reached La Motte-de-Bois. 13 April: These positions were heavily shelled at daybreak. The battalion was ordered to withdraw to Le Parc, another assembly point for the 50th Division. 15 April: The remnants of the 4th Battalion reached this place during late afternoon. Trenches were dug south of Bois des Vaches by working parties and stragglers came in to rejoin the ranks. Private Walter Morley is recorded as “died” 15 May 1918. His service record has not been researched the War Diary of the 4th Battalion, the Yorkshire Regiment is not available therefore little can be added to the above. It is assumed that Private W. Morley was wounded between the 10th and 15th April during the withdrawal from Sailly-sur- la-Lys. 27 April: the battalion proceed by train to Courville for re-organisation. Following this difficult period, the Division was withdrawn and sent to the Aisne, believed to be a much quieter area however this proved not to be the case as the Division was hit by the next phase of the offensive, the Battle of the Aisne, 27 May to 6 June 1918.